In support of National Suicide Prevention Awareness Week and World Suicide Prevention Day, Each Mind Matters is excited to share materials and resources that can assist you in planning activities and events in your county and community. The Know the Signs (KTS) campaign is an effective way to promote suicide prevention in your community. The campaign encourages community members to know the warning signs of suicide, find the words to offer support to someone, and reach out to local resources. View all suicide prevention materials and resources that are available for free download from the new Each Mind Matters Resource Center at EMMResourceCenter.org. Share the Suicide Prevention Activity Tip Sheet for ideas to use statewide resources to augment your activities and communications around Suicide Prevention Week and beyond. Share these drop-in articles for placement in newsletters, blogs and local media. 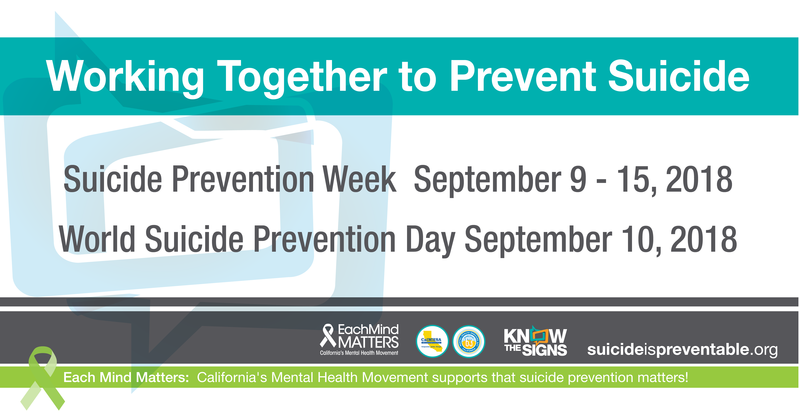 Work with your board of supervisors to issue a Proclamation for Suicide Prevention Week. A template is provided in the toolkit. Post and tweet! Use pre-written Facebook and Twitter posts and graphics. A selection of social media posts are also provided in Spanish. Refresh yourself on some helpful guidelines when posting about suicide prevention on social media. Play “The Rock” – a 30 second radio spot while callers are placed on hold to local 2-1-1 or county access lines or reach out to a local radio station. The spot can be customized. Use one of these digital banners to customize your suicide prevention emails and materials or post them on your website. Share these daily suicide prevention emails with staff, partners and community members. When crafting your messages about suicide prevention, take a second look and make sure they align with safe and effective messaging recommendations by reviewing our Messaging Matters tip sheet. The National Action Alliance Framework for Successful Messaging is a great starting point for strategizing your suicide prevention messaging. Learn more at SuicidePreventionMessaging.org or listen to the recording of the Each Mind Matters webinar: Messaging About Suicide Prevention. Whenever you reach out to or respond to local news, share these recommendations for reporting on suicide. And be sure to review the Making Headlines guide for tips to work with the news media. Suicide Prevention Week is an opportunity to emphasize that everyone can play a role in suicide prevention. View the Activity Tip Sheet and reach out to local businesses in your community. A supply of coasters and coffee sleeves can be requested from [email protected] (while supplies last). Ask a local coffee shop to use the Know the Signs branded coffee sleeves. Ask local restaurants and bars to hand-out the Know the Signs branded coasters. Share a Know the Signs poster and brochure for additional information and share why suicide prevention matters and how everyone can play a role. Latinos represent the largest minority group in the county and about 30 percent are under the age of 18. Data tells us that Latinos have a rate of depression that is higher than any other minority group except Native Americans and that Latina youth have a higher rate of suicide ideation and suicide attempt than their white peers. A suicide prevention focus on Latinas requires engaging the community, parents and schools to help reach Latinas and their helpers with a message that they are not alone, are loved and help is available. A drop-in article that can be customized or used as-is, for placement in local media, newsletters and blogs reaching the Latino community. 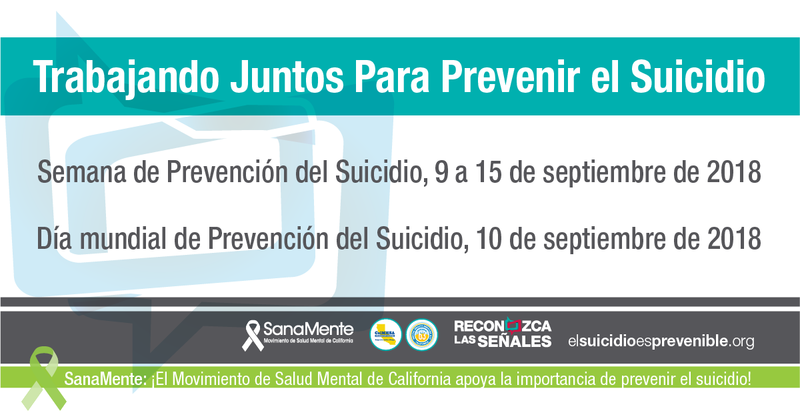 The Reconozca las Señales campaign is an effective way to promote suicide prevention in your community. The campaign encourages community members to know the warning signs of suicide, find the words to offer support to someone, and reach out to local resources. Post and tweet! Use pre-written Facebook and Twitter posts and graphics. – Coming soon! Play “Reconozca Las Señales” – a 30-second radio spot while callers are placed on hold to local 2-1-1 or county access lines or reach out to a local radio station. The spot can be customized. Each Mind Matters Resources in Spanish Hand-Out describes and provides links to resources and materials in Spanish for the Latino Community. “The Flip Chart/El Rotafolio” a culturally responsive suicide prevention (train the presenter) training. The two-day training enables participants to present on suicide prevention with aid of a flip chart. The training includes safeTALK, a review of the flipchart approach and Know the Signs Campaign, opportunity to practice the presentation, and a review of resources and materials. The training is provided in English or Spanish. Anyone working with parents, young adults and the community will find value in taking this training. View and listen to the webinar recording and outcomes of the pilot on the Each Mind Matters website. View the El Rotafolio Brochure which summarizes the findings from a comprehensive evaluation study here. Lotería or Bingo is a recognized fun ﬁlled social activity and can be a great way to increase awareness and resources about mental health and suicide prevention. 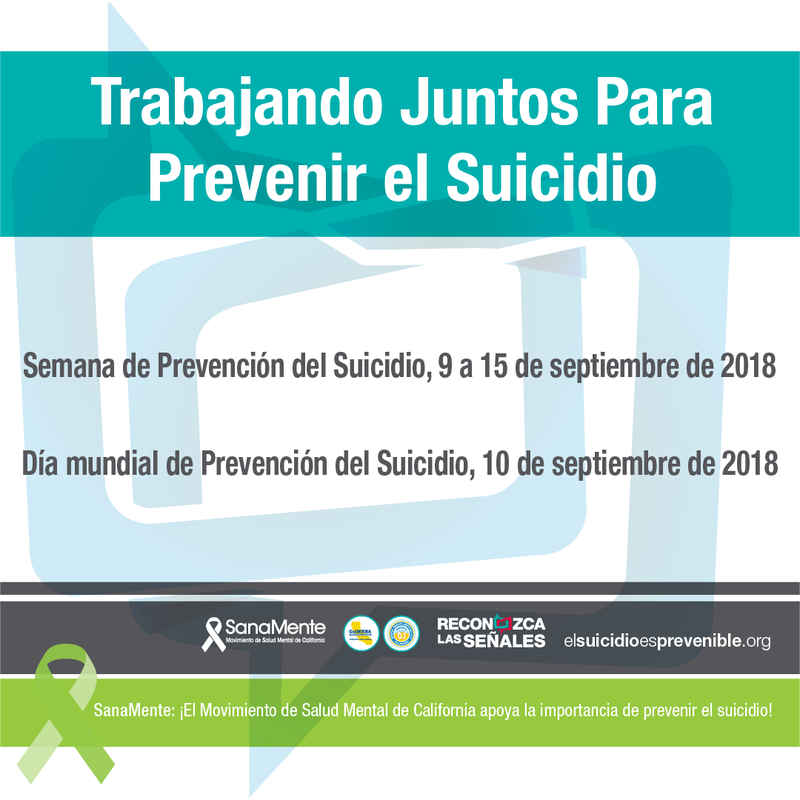 The Reconozca Las Señales Lotería provides information about mental health and suicide prevention. Share with schools and partner agencies. The game can be played as part of a school mental health event for Spanish speaking parents or as part of a parent workshop session in a health center or clinic focusing on Spanish speaking community. The game is available in English and Spanish. View the instruction sheet below to learn how to play the game and how to download materials. Approximately 70% of suicide are among working age adults, and the numbers of suicides in this age group is rising. Reaching working age adults with suicide prevention messaging can be a significant challenge. They are dispersed throughout communities in a very broad range of settings, but most adults spend a significant amount of their time at work. For many time at work is balanced, often precariously, against the need to care for children and aging parents at home with few resources left over for self care. Despite the challenges, the call to action is clear. Comprehensive strategies for workplace suicide prevention have been developed that are based on successful, evidence-based programs. The resources in this year’s toolkit have been developed based on these programs and strategies. We encourage you to use the following resources to promote workplace suicide prevention in your community, and share them with others. Host a What I Wish My Parents Knew Event to educate parents about suicide prevention and mental health, as well as other topics their study body wish their parents knew about. Engage youth by creating a film about suicide prevention or by implementing a suicide prevention activity. Create a Suicide Prevention Hand-out and distribute it to all staff. A template is provided below and includes warning signs and customizable information about your schools’ referral process. Complete the postvention checklist for your school. Suicide Prevention Activity Tip Sheet for Schools: This tip sheet includes a range of activities that both schools and organizations can implement to engage youth in suicide prevention and mental health. What I Wish My Parents Knew Step by Step Guide provides detailed information on how to replicate this event in your district. The Suicide Prevention 101 Prezi provides information about the warning signs for suicide and how to provide support intertwined with short youth-produced films. Suicide Prevention Brochures and Tent Cards: These resources provide the warning signs for suicide and how to offer help in several languages. All can be found on the Each Mind Matters Resource Center. Please email [email protected] to order printed copies. Suicide Prevention One-Pager for School Staff: To address AB2246, which requires all districts and LEAs in California to implement suicide prevention policies, it is integral to provide school staff with information to raise awareness about suicide prevention. This brief handout is intended to give staff a brief overview of suicide prevention including information on warning signs, questions to ask to identify students at risk of suicide and contact information for referrals on campus. This document includes a section to be customized with referral information specific to a school site. Postvention: Responding to Suicide in your School Community: Often schools are unsure how to respond after a suicide or may engage in activities that can actually increase suicide risk among other students. It is vital that schools are prepared to respond appropriately and effectively to a suicide in the school community whether that be of a student, staff or parent. To assist schools in the development of best practice suicide “Postvention” response, we recommend reviewing the following resources. After a Suicide: A Toolkit for Schools (2nd Edition): This toolkit assists schools in implementing a coordinated response to the suicide death of a student. Originally developed in 2011, the second edition includes new information and tools that middle and high schools can use to help the school community cope and reduce suicide risk. Postvention Checklist (From SAMHSA’s Preventing Suicide: A Toolkit for High Schools, Chapter 3: Postvention): This two-page document provides a 17-point checklist to support your district or school in developing an effective response to a suicide death in your school. The checklist provides guided steps and customizable sections for including contact information for engaging supports. The Directing Change Program & Film Contest encourages young people in grades 7-12 and/or ages 14-25 to create 60-second films about suicide prevention and mental health. Encourage young people to submit a film to the contest or host a local screening. To view and download films and find several suicide prevention resources for schools and young people, visit DirectingChangeCA.org. Active Minds’ Suicide Prevention Week: Active Minds wants everyone to know — a conversation can be life-changing. “Here For You” is a positive campaign for mental health awareness and suicide prevention. If you’re not sure how to start the conversation, explore Active Minds’ easy, three-step V-A-R guide on what to say and do. 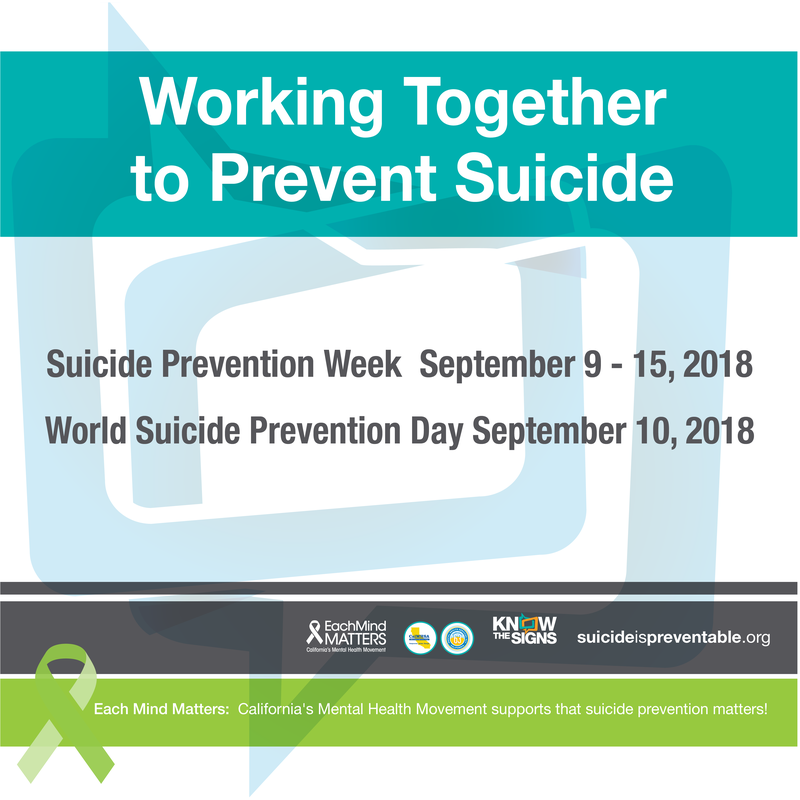 And a final note – as your plans for Suicide Prevention Week develop, add them to our events page, especially if the events are open to the public and/or you would like others in your county and state to know about them. Take 5 to Save Lives – We encourage you to check-out and share the social media posts, drop-in articles and posters in their toolkit.